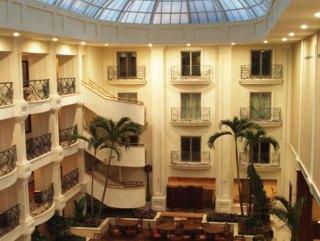 The hotel comprises a total of 93 rooms spread over 4 floors. Facilities include: lobby with 24-hour reception - elevator - restaurant - bar - cafAc - Internet-WLAN access - safes and currency exchange. There is also a function room for events-conferences and a business centre (equipped with fax - scanner - Internet - photocopier - computers and printer). Room and laundry services are available as well as medical assistance. The hotel has its own parking facilities for guests arriving by car. The hotel is focused to business people as well as family visitors who will enjoy an excellent service in the full-equiped rooms and suites and the quality of Marriott hotels.